The Bound Forum • View topic - Made a set of ankle cuffs for a friend. Made a set of ankle cuffs for a friend. I thought I'd share my most recent creation. 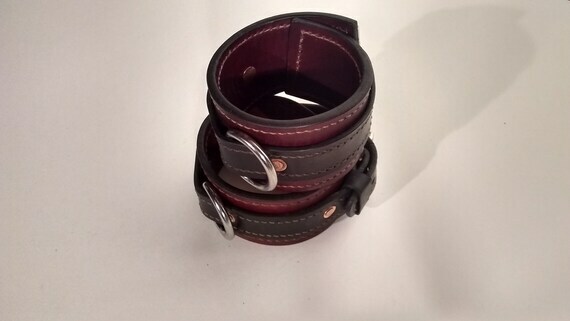 I made a set of leather cuffs for a friend. He said they were for someone else originally, but his wife took a liking to them. Apparently she really liked them, and requested that I do a matching ankle set. How fun! Of course I agreed to make the set. I do them all by hand, punched, riveted, and sewn, so it took a few weeks, but now the set is complete. Its fun, its a hobby and a kink. I like that other people are into something that I made, personally. Thought I'd share! I do occasionally sell stuff, but these are already spoken for. Just sharing! 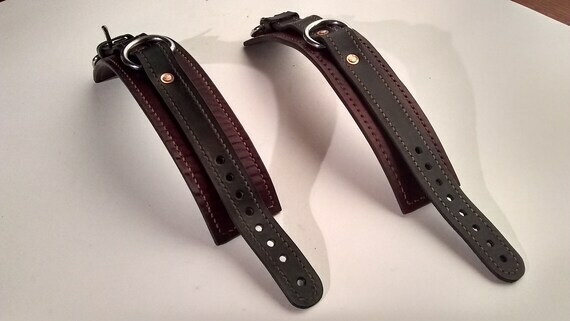 Re: Made a set of ankle cuffs for a friend. I made a collar too... but I think its too heavy duty. Its pretty intense. I'm still learning, I should have done the whole set at the same time to get more consistent coloring. Oh well, it came out well I think. Did another set. I've never worked with suede lining, so I figured I'd give it a shot. Its buttery smooth, kinda fun.